Who's Bigger than Coca-Cola? One Boston mobile company! A Boston start-up company, Jana, has access to 2.1 billion consumers, via their cell phones. That is probably more than any other company in the world, including the large global retail companies such as Coca-Cola or P&G. And Jana is growing and hiring in order to build a solid business on this remarkable fact. Jana has the technical capability to give minutes to these 2.1 billion owners of cell phones. In many parts of the world cell phone minutes are as good as cash, in some ways even better, because minutes can be transferred with greater ease. Let us just pause for a minute, and consider this fact. A Boston start-up company has the business model and the technical wherewithal to send money to a significant fraction of the world's population, mostly in the developing world. For 60 years or so, money has flowed, in the form of aid, to the developing world, where it has failed to achieve much, largely because it ended up in the pockets of a few and never helped the population as a whole. Gatekeepers kept it to themselves, and aid organizations had no way of bypassing them. So how can you have money flow to a large fraction of this planet's population without it being pocketed on the way? And where could this money come from? Jana's answer is this: large retail companies want to sell to the fast growing middle class in Asia, Africa, and Latin America. 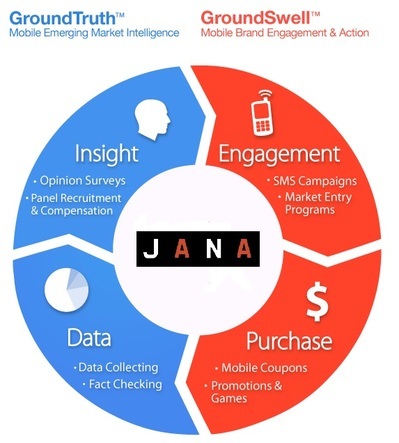 Their marketing organizations need data about their potential customers, and Jana can get that data for them. So marketing companies pay for a survey, for example. Once consumers have responded to the survey, they are paid in cell phone minutes. They are paid for a service of interest to companies with large marketing budgets. No intermediate has any interest in blocking these transactions. Potentially, this is a great business for all sides. The retail market in the developing world can grow, and the world's poor can raise their income significantly - Nathan Eagle, Jana's founder and CEO estimates by as much as 5%. Considering the miserable failure of aid organizations over the last 60 years, this would be a stunning achievement. Because Jana is Boston based, it is also great news for Boston: Jana is hiring. Eagle explains that he needs a product manager most urgently, someone with more than three years experience in consumer web products with daily, direct responsibility for performance and funnel metrics. Jana has other openings too. And intermittently, Jana needs cultural expertise in the many countries where they will be active â€“ an expertise that Boston's many diasporas possess and could get paid for! Arne Hessenbruch is a Danish expat and the founder of Boston Denmark Partnerships, where he connects Danish companies with an interest in doing business in Boston. Your website is optimized, where to from here?